Pick And Place Screw Capping Machine Is N.K Industries‘s Novel Approach & Innovation Over Contemporary Shute Pick Up Screw Capping Machine In Order To Assure 100% Quality Capping. Pick And Place Screw Capping Machine Are Rotary Model And Available In 4 Head , 6 Head , 8 Head Configuration To Meet Wide Range Of Production Output Of Modern Cosmetic , Food And Pharmaceutical Screw Capping Requirement. We Have Comprehensive Range Of Jar Capping Machine Which Works On Shut Pick Up Principal. 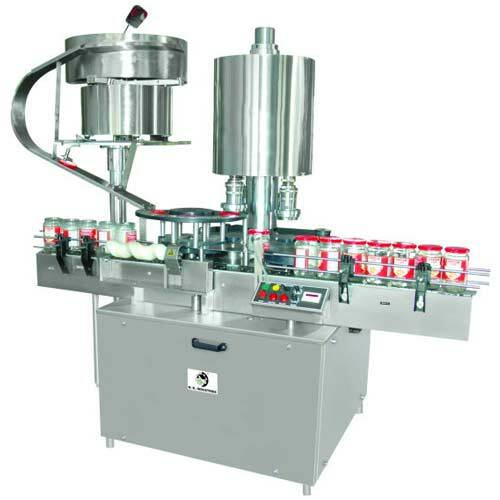 This Rotary Jar Capping Machine Can Be Made Available In 4 -6-8-12 Head Configuration Depending Upon The Production Output Requirement At Customer End.